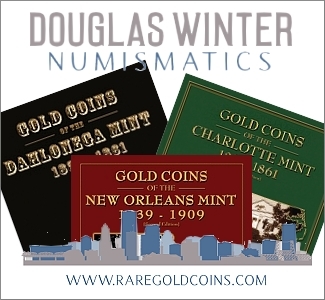 Of the four denominations struck at the Dahlonega Mint, half eagles are the largest in size and have (by far) the most struck, both in terms of individual dates and total produced. This denomination was made from 1838 through 1861, and there were a total of 26 issues. This set lends itself well to specialized collecting. While there are a few expensive single issues, there is nothing impossibly rare or high-priced. 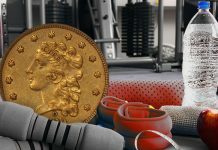 Most of the coins can be located without too great an effort but locating the right coin can be surprisingly difficult, even for the so-called common dates. And if the collector really falls hard for this set, there are numerous die varieties (ranging from the mundane to the significant) that could keep the set going indefinitely. 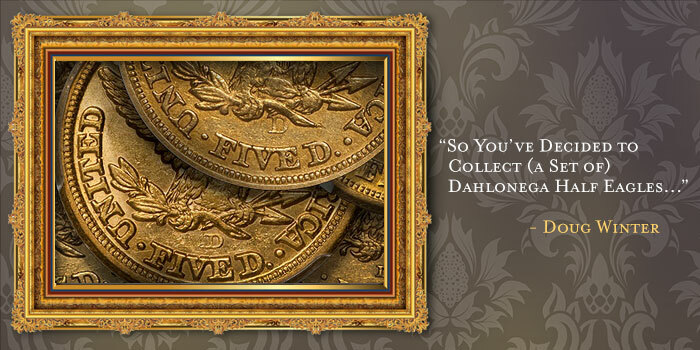 In this article, I’m going to focus on three different tiers of Dahlonega half eagle set collecting. I’m going to define them as Regular, Spiffy, and Extra-Spiffy. I’ll discuss which dates are the most challenging to locate, what you can expect to spend, and how long and how realistic the set-building process will be. 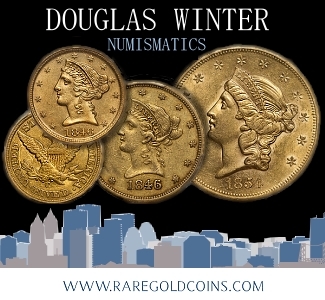 The regular set of Dahlonega half eagles is based around nice, affordable coins that are mostly going to grade VF and EF, with a few AUs sprinkled in. 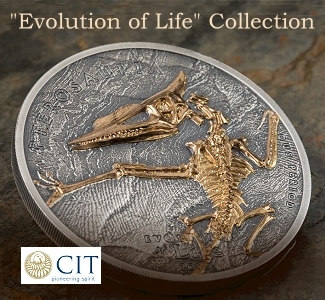 The coins will typically cost in the $2,000-3,000 range, with a few $5,000-6,000 pieces. 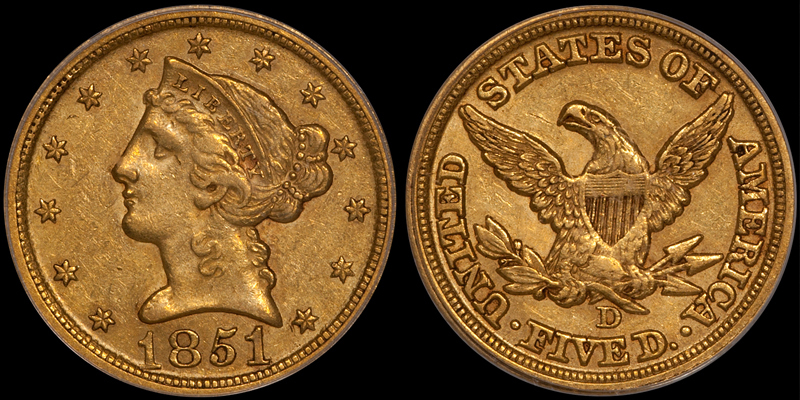 A set like this can’t quite be complete as the 1861-D will be a budget-buster. The other 25 dates should be available, although three or four will be very difficult to find both affordable and cosmetically appealing. 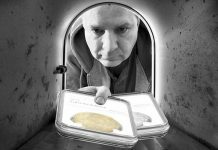 Just because you don’t have an extra-spiffy budget, this doesn’t mean that you can’t be a finicky buyer. 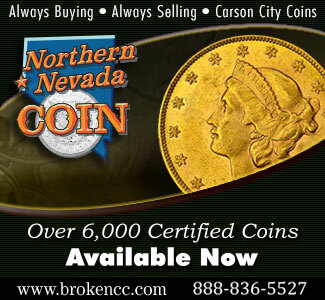 In the $2,000-3,000 range, you can expect some very wholesome coins with nice natural color and honest, even wear. There are at least 15 (if not more) dates that one can realistically to locate in VF or EF grades at less than $3,000. 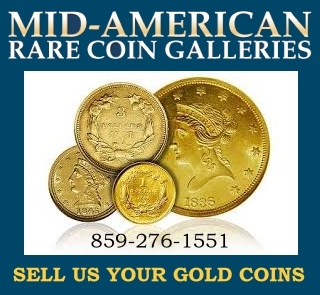 These are the 1842-D Small Date, 1843-D, 1844-D, 1845-D, 1846-D/D, 1847-D, 1849-D, 1851-D, 1852-D, 1853-D, 1854-D, 1855-D, 1857-D, 1858-D, 1859-D, and 1860-D. There is another group of dates that won’t be much more expensive (let’s say $4,000 or less) but which will be harder to find. These are the 1840-D, 1841-D, 1846-D, 1848-D, 1850-D, and the 1856-D.
Two more dates are realistic for this set but will require a budget closer to $7,500 each for a nice VF or a lower-end EF; these are the popular 1838-D and 1839-D. 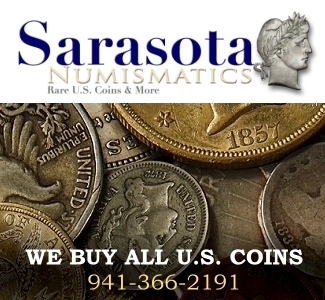 This leaves us with two remaining coins: the 1842-D Large Date and the 1861-D. If you can stretch to around $9,000-10,000, you will be able to buy a presentable example of the former. 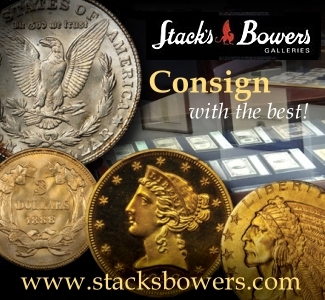 There are very few nice collector-grade pieces known, so I would suggest a quick response if you ever have the chance to buy one you like at a number you can live with. And what about the 1861-D? This has become an expensive issue and the only one you are likely to find in the $10,000++ range is either damaged or a very worn piece that has been harshly cleaned. 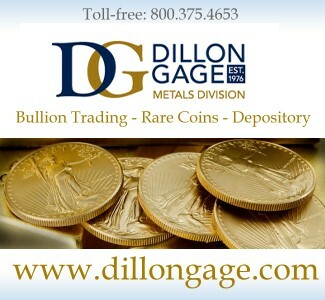 I would strongly suggest you pass on such a coin as your money will be better spent on more common issues in your preferred price range. Decide on a “look” which appeals to you and try to stay with it. 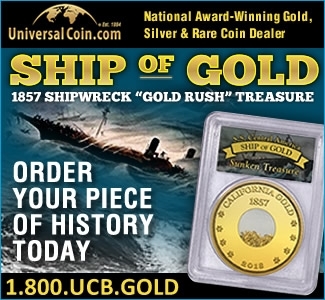 As you can imagine, I like coins which are nicely toned and as original as possible. In many cases, a really nice EF45 can be a better addition to your set than a so-so AU53. 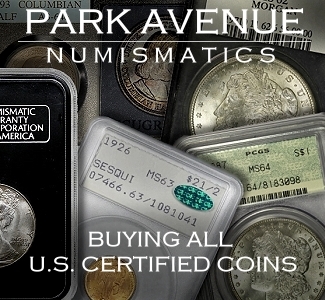 This also holds true for higher-grade coins (say, a really nice AU58 versus a marginal MS62). 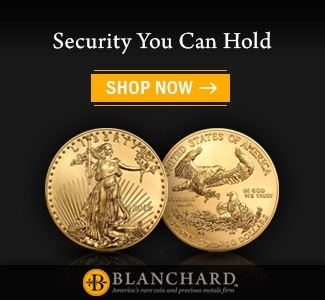 A set containing all (or nearly all) CAC-approved coins in this price range is not out of the question. 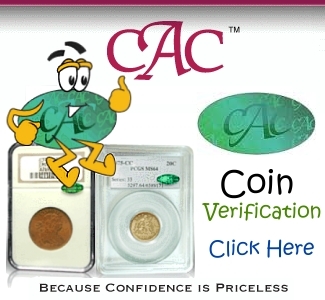 Don’t overspend for a lower-grade common date coin with a CAC sticker as this doesn’t merit the extra dollars. But paying, say, an additional $250-500 for a really cherry EF with a sticker makes lots of sense to me. Learn about which dates are found with which color(s) and which dates come weakly struck. Buy a copy of the third edition of my Dahlonega book and learn about the characteristics of each issue. A nice set using grades discussed above can be assembled for $75,000-90,000. 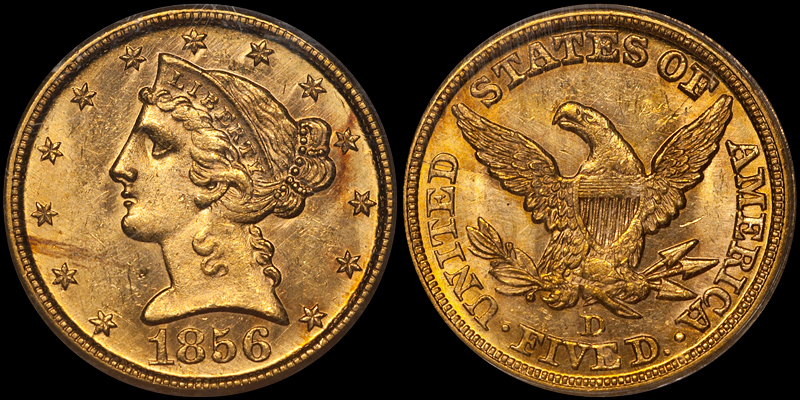 This won’t include an 1861-D but it will consist of 25 coins in the VF25 to AU50 range with most coins grading EF. The so-called Spiffy Set of Dahlonega half eagles is going to be of higher quality than the set we just discussed above, but it still isn’t out of reach for all but the wealthiest collectors. This set is going to feature mostly Choice AU coins (in the AU55 to AU58 range) with a few lower-end Uncirculated pieces (MS61 to MS62) sprinkled in. The two exceptions are likely to be the 1842-D Large Date, which will probably be in the lower range of AU, and the 1861-D, which is more likely to be an EF45 or possibly an AU50. The more common date Dahlonega half eagles are still remarkably affordable given their scarcity and popularity. A nice AU55 can often be found for less than $5,000, while a high-end AU58 is often available for $7,500 or less. 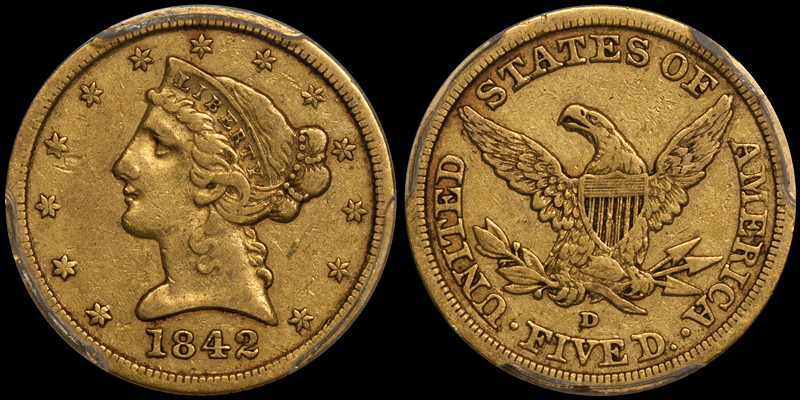 One thing that CAC has confirmed (although I’ve been writing about this for years) is that even the most common date Dahlonega half eagles (issues such as the 1843-D through 1845-D, and the 1852-D through 1854-D) are really hard to locate in PCGS/CAC AU55 to AU58. 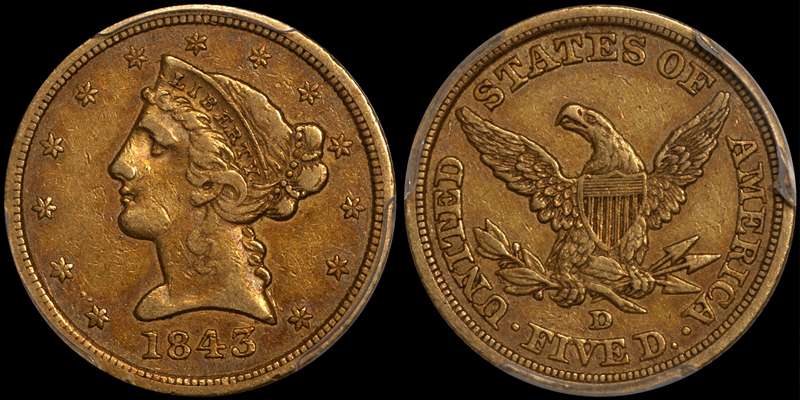 As an example, the very common 1843-D has a CAC population of just two coins in AU55 and one in AU58, while the 1853-D is more available but still has small populations of five in AU55 and nine in AU58. These populations are potentially even smaller when one factors in resubmissions and CAC coins that are nice but not really nice. 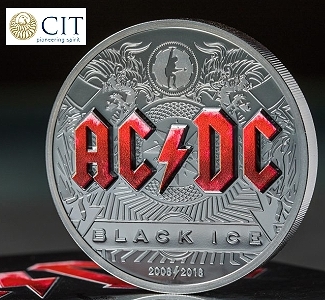 The dates that will be more difficult to locate in the AU55 to AU58 range (even without CAC approval) include the 1840-D, 1841-D, 1846-D, 1848-D, 1851-D, 1855-D, and 1856-D. 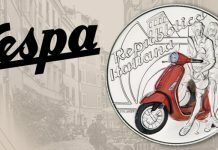 But don’t let me discourage you as these coins do exist, and when really nice AUs become available you won’t have to pay crazy premiums. 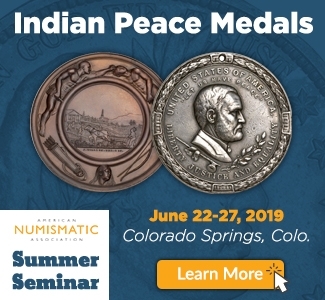 So… the good news is that 22 of the 26 dates in this series are likely available at $7,500 or less for nice AUs, and if you are working with a good dealer you should be able to locate most or all of these in a three-to-five-year period. 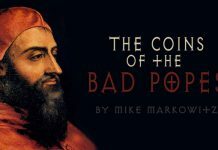 The bad news is that you are left with four coins which are either more expensive or much harder to find. 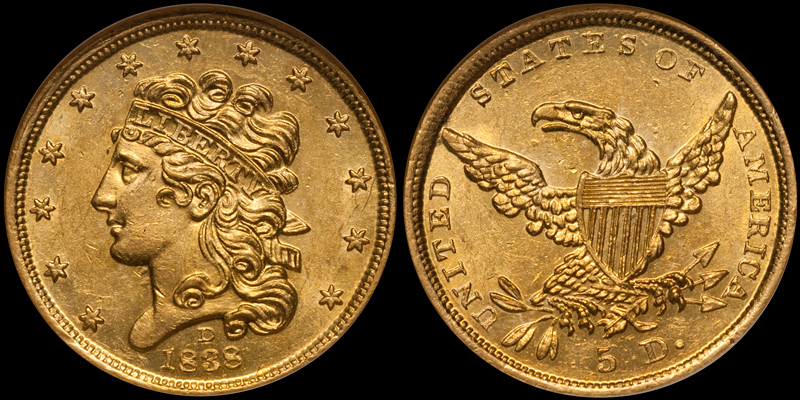 Nice 1838-D half eagles are easier to locate than one might expect. 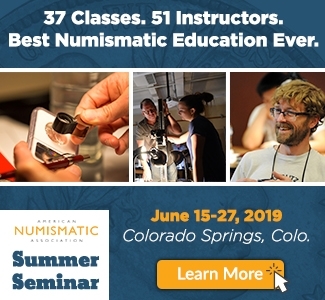 There are five with CAC approval in grades between AU55 and AU58, and there are likely this many (or a few more) that aren’t CAC-approved but which would pass my quality test. 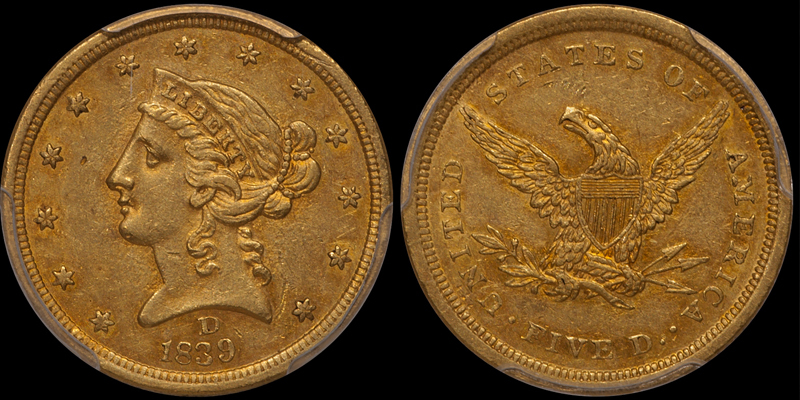 The 1839-D is similar in high(er) grade rarity with five approved at CAC in grades between AU55 and AU58. You’ll have to spend at least $15,000-20,000 for each of these. 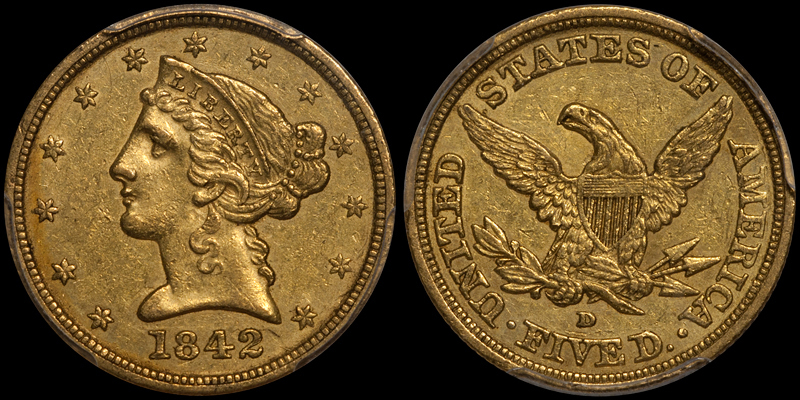 The 1842-D Large Date is the rarest issue in the series in higher grades. Only three have been approved by CAC in AU (I’ve handled all three) and none are finer than AU55. As there are none with CAC approval in any EF grade, you’ll either have to be patient or wait for a nice non-CAC piece to come available. 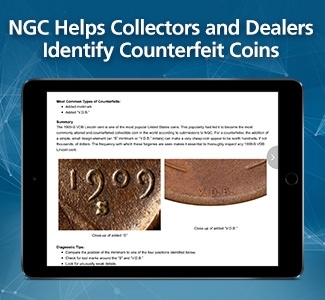 Despite this coin’s rarity, I’ve sold two very nice PCGS/CAC AU55s in the high 10s/low 20s. Which brings us to the 1861-D. Between the EF45 and AU58 bookend grades, there are actually six with CAC approval. A properly graded EF will be very hard to locate as most 45s have gradeflated into AU50 or AU53 holders. 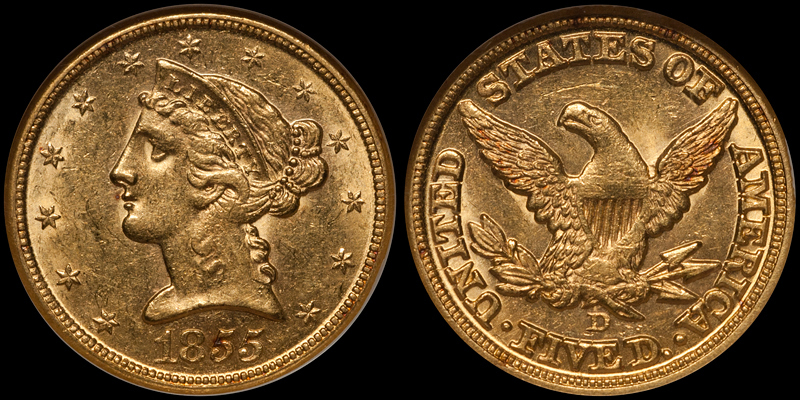 You can figure on spending at least $50,000 for a really nice 1861-D. The total expenditure for a Spiffy Set of Dahlonega half eagles is going to run around $250,000-275,000. You can reduce this figure by maybe 10-15% by sticking with AU55s on most of the common dates, but my guess is that once you’ve bought a few nice AU58s, you’ll prefer this quality when it is available. Let’s say you get the Dahlonega bug in a serious way and you have the budget to scratch your itch. Is a world-class collection even feasible in today’s market and, if so, how would a collector of means go about this? 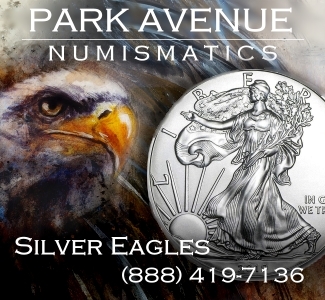 Every Dahlonega half eagle is known to exist in Uncirculated. 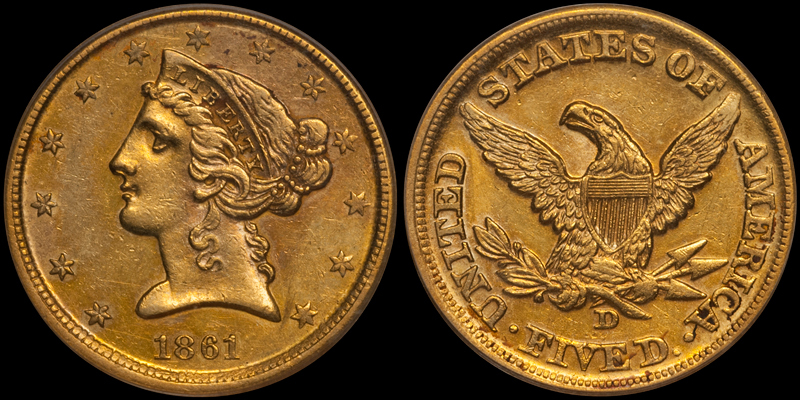 The rarest issues in very high grades (MS60 and finer) are the 1842-D Large Date, with perhaps three or so known, and the 1850-D, 1851-D, and 1855-D with fewer than five or six currently accounted for. 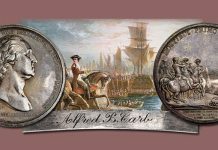 The most expensive coin in the set is going to be the iconic 1861-D, but this issue is more available in Uncirculated than most collectors realize with as many as 10-12 known. There are essentially two ways to go about building an Extra Spiffy set of Dahlonega half eagles. 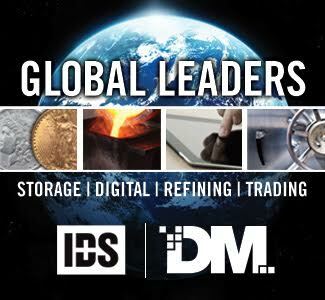 The first is to charge into the market like the proverbial bull in the china shop and to vacuum up all the overgraded MS61 and MS62 pieces that have lingered in dealer’s inventories. The second is to quietly approach the collection, to learn as much as possible about each issue, and to pounce on the rare pieces which are suitable for a really high-end collection. You’ve, no doubt, already discerned which approach I favor. There is no such thing as a “common date” Dahlonega half eagle in properly graded MS60 or finer. 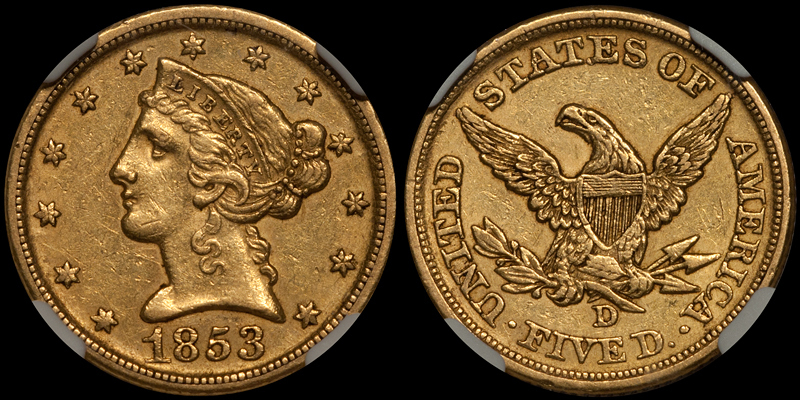 Even the more available dates such as the 1853-D and the 1854-D become very difficult to locate in MS62, and every D-mint half eagle is very rare in properly graded MS63 and above. Could a Mint State set of all CAC-Dahlonega half eagles be assembled? 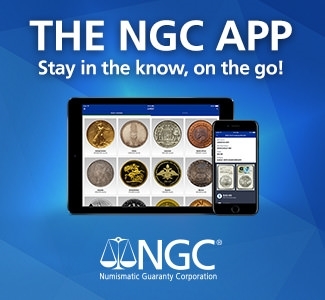 The answer is a resounding no as the following dates have still not been stickered by CAC in any Uncirculated grade: 1842-D Large Date, 1850-D, 1851-D, 1855-D, and 1856-D. This doesn’t even take into consideration that at least eight other dates have Uncirculated CAC populations of just one or two. 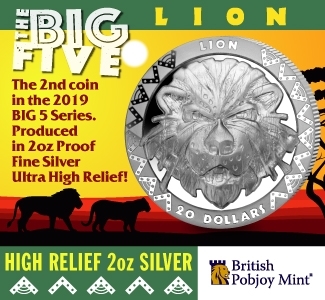 If a savvy collector is willing to include some very nice but not quite CAC-quality coins, the ability to complete this set becomes far more realistic. I have seen (and sold) numerous almost there Uncirculated Dahlonega half eagles that would be nice enough for absolutely any set. As you might have guessed, building a great Dahlonega half eagle set isn’t easy, and it’s certainly not cheap. 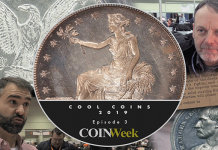 We’re looking at around 20 coins with an average cost of around $25,000++, and another four coins that will run around $40,000-50,000 each. 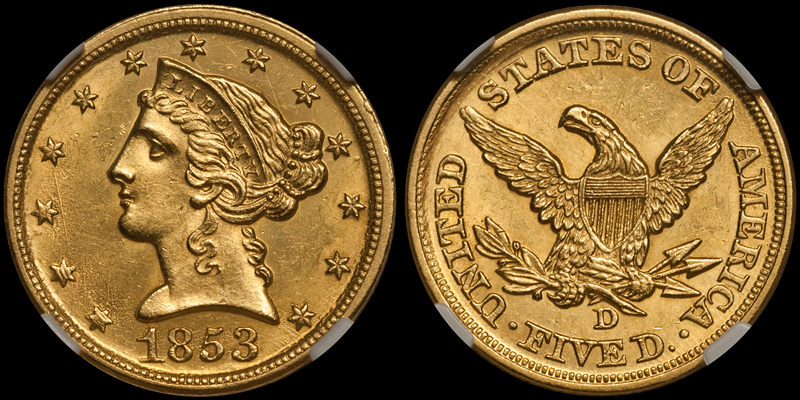 This leaves us with the 1842-D Large Date which we will figure at $25,000, and the 1861-D which we will cost in at $100,000. That puts the cost at around $825,000, and this number will probably top $1 million when all is said and done. It is important to learn the difference between real luster and brightness, which is created by rubbing the surfaces with abrasives to simulate luster. My book discusses surface textures for every issue from this mint. It is also important to learn to distinguish between original color and added color. 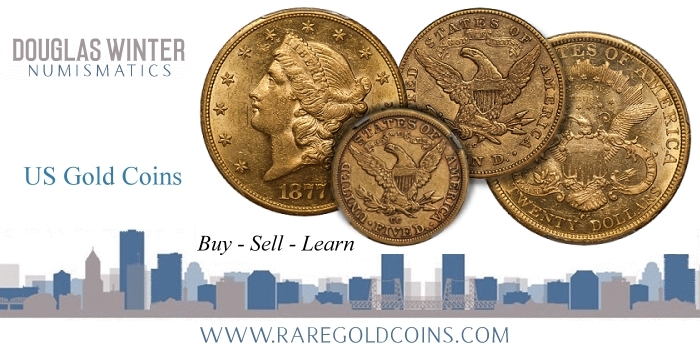 Some slabbed Dahlonega half eagles in comparatively high grades show blatantly fake color and these should be avoided. Current third-party grading is oriented towards eye appeal. This means that most coins in MS60 and MS61 (and even many in MS62) show friction on the high spots and in the left obverse field (the most open area of the Liberty Head half eagle design). If you can’t live with this, I suggest either buying nice AU55 and AU58 coins or, if possible, sticking with MS63 and finer coins if and when they are available. As a rule, Dahlonega half eagles are far better made than their gold dollar and quarter eagle cousins. 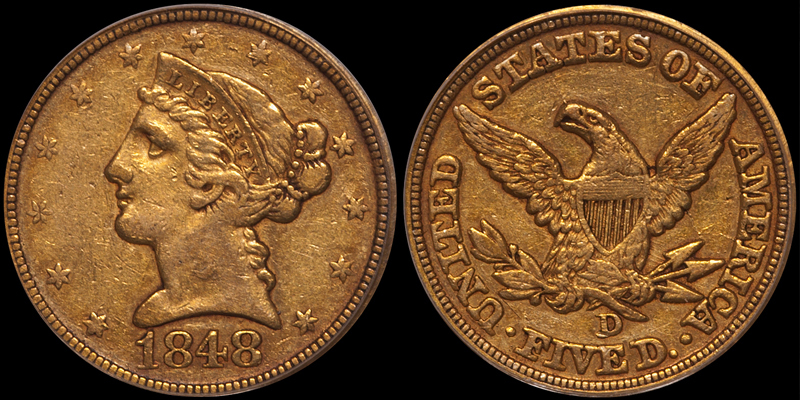 There are a few issues in the half eagle series (1848-D, 1851-D, 1855-D and 1856-D) which can be difficult to locate well struck but in most instances it should be possible to acquire a decently struck coin on a nice quality planchet. Are you interested in assembling a great quality set of Dahlonega half eagles? 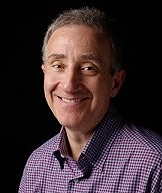 Why not work with the world’s leading expert Doug Winter; literally “the man who wrote the book?” Contact Doug by email at dwn@ont.com to begin your collection!